This paper was supported by the Office of the Assistant Secretary for Planning and Evaluation through Contract #HHSP23320100021WI. 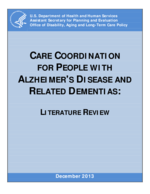 The authors gratefully acknowledge the useful comments of Helen Lamont, PhD, of the Office of Disability, Aging and Long-Term Care Program within the Office of the Assistant Secretary for Planning and Evaluation, U.S. Department of Health and Human Services (HHS). The views expressed in this paper are those of the authors and not necessarily those of HHS or RTI International.